Math is my least favorite subject. When my daughter, Izora was in third grade she came home with her first set of math word problems. She asked for my help. After reading it aloud 5 or 6 times, I finally got it! I was so excited! “Izora, I figured it out!” She said “yeah, me too, the second time you read it aloud.” That was the last time I helped Izora with her homework. I was delegated to supply poster board from there out. My point is don’t turn creating your wedding budget into a math word problem where it takes you 5 or 6 times to get it right. Before you start running around looking for the dream wedding venue or “pinning” Oscar de la Renta wedding gowns, start crunching your numbers. 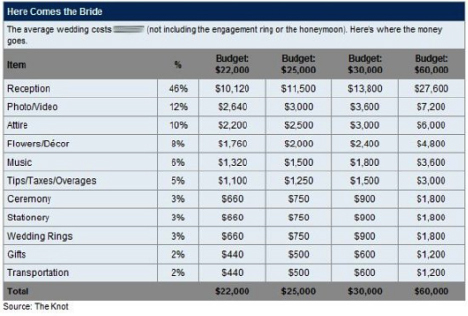 These days about 70% of couples personally pay for part or all of their wedding day expenses. Start by breaking down your budget. Making the “Ask”: How to find out if your parents can help. Money conversations can be awkward, so each of you should schedule a face-to-face meeting with your parents. He with his and she with hers. No fiancées allowed! Let your parents know how excited you are to be planning your wedding – we are starting to make our budget and we are curious if you could contribute financially. If they say “no”, just stay calm and use your own money. If you get “yes”, give hugs and a million thank you, thank you, thank yous! Next, get out that bridal binder, we all know you have one, quite possibly for years. Make a spreadsheet to track your spending every step of the way. Don’t try and wing it because you will find yourself busting your budget in at least a couple of categories. Be aware of hidden costs and make sure that you have a detailed, signed contract with each of your vendors. Don’t hesitate to ask your Dad or Mom to read things over before you sign on the dotted line, and hand over that “non-refundable” deposit – especially if Dad and Mom are helping out with the wedding costs. Look at it as a way of involving them without having to listen to them tell you what flowers you should be picking out for your bouquets. With 79% of all couples eventually going over budget, it’s important to keep your priorities in alignment with your budget and your overall personal financial health.